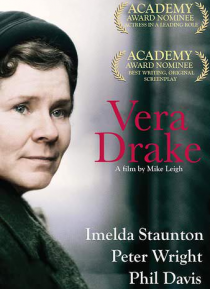 London, 1950: Vera Drake lives with her husband Stan and their grown-up children, Sid and Ethel. They are not rich, but they are a happy, close family. Vera cleans houses, Stan is a mechanic in his brother's garage, Sid works for a tailor and Ethel works in a factory testing lightbulbs. But selfless Vera has a sideline which she keeps secret from all of those around her: without accepting payment,… she helps young women to end unwanted pregnancies.